Version 4.00, last updated on March 12, 2011. Wolverine Files reader Glen Cadigan points out, however, that the montage was actually a piece Cockrum did while working at DC Comics a year before joining Marvel. Specifically, a montage of villains for the Legion of Super-Heroes called The Devastators (seen in its entirety here at Legionworld.net) with the Wolverine character bearing a striking resemblance to Fang from X-Men #107. Legendary Marvel Comics artist John Romita, Sr. was then assigned the task of designing the character. 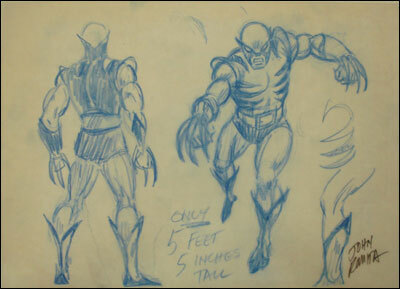 At first, he “…thought a wolverine was a female wolf!” He and Len Wein “…discussed Wolverine’s look after going straight to the encyclopedia… [and seeing] a shot of a wolverine… That’s the way it evolved, eventually including the claw idea and the general claw shapes repeated on the costume.” It is interesting to note that Romita rejected an intriguing concept along the way. “Originally, his claws were going to come out of his fingertips like a cat’s, but that was too grotesque and they just didn’t appear as strong as I wanted them to be.” Wolverine finally debuted in The Incredible Hulk #180, with Herb Trimpe using Romita’s sketches as a guide. Knowing that Marvel was considering reviving the superhero team of the X-Men with an international flair, Wein intentionally made the Wolverine a mutant. What is not readily apparent is that Wein intended the Wolverine to be a teenage mutant with claws extending from a pair of special gloves. “He was a mutant only in terms of his ferocity and animal senses. He was a hunter and a tracker and incredibly resilient. He was able to get the stuff knocked out of him by the Hulk and still be able to get back on his feet.” In fact, Wein would have made Wolverine as super-humanly strong as Spider-Man had he continued writing the X-Men. 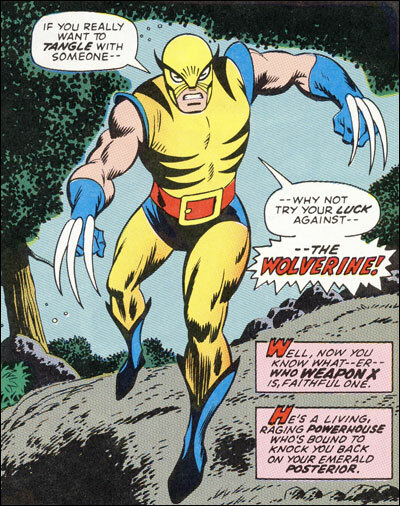 Dave Cockrum later asserted that originally, he and Len Wein intended Wolverine to be revealed as a mutated wolverine, but Stan Lee nixed the idea. Herb Trimpe and Jack Abel, Incredible Hulk #180. Peter Sanderson, “Wolverine: The Evolution of a Character, ” The Incredible Hulk and Wolverine #1, 1986. “Interview with Dave Cockrum,” The X-Men Companion I, 1982. Richard Ho, “Who’s Your Daddy,” Wizard #157, Nov. 2004. Craig Shutt, “Secret Origins,” Wizard’s Wolverine Special, 1999. “Dressed to Kill,” Wizard Wolverine Masterpiece Edition, Dec. 2004. James Busbee, “Killer Fashion Sense,” Wizard’s Wolverine Special, 1999. “Interview with Len Wein,” The X-Men Companion, 1982. Scott Beatty, “Beastmasters,” Wizard Tribute to Wolverine, 1996. I really like what you did with the forum. This site is one of the few things I look forward to. I agree, I absolutely love this forum. I eagerly await all updates the the chronology. 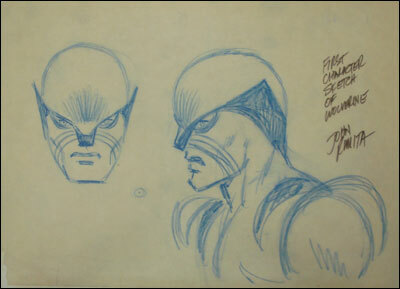 Does anyone have a copy of Byrne’s original mask-less concept?